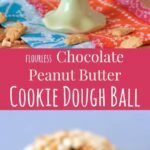 Chocolate Peanut Butter Cookie Dough Ball looks like a rich, sweet treat, but is actually a healthy snack with fiber & protein from a secret ingredient. 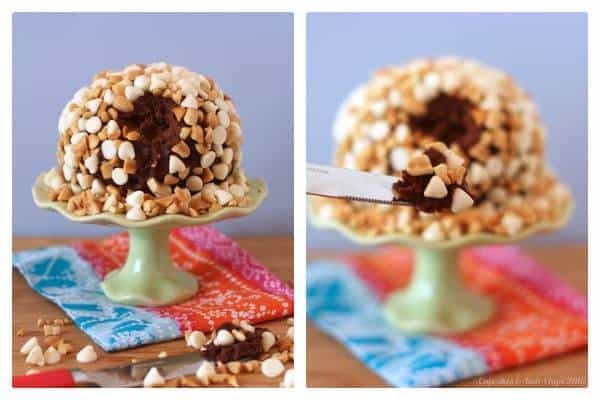 Chocolate Peanut Butter Cookie Dough Ball is a sweet dessert dip with the favorite combination of chocolate and peanut butter. But with secretly healthy ingredients that are also gluten free, grain free, and can be made vegan, it’s totally OK to eat cookie dough for lunch or as a healthy snack recipe. 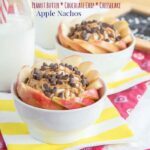 It’s just one of my favorite easy gluten-free dessert dips. 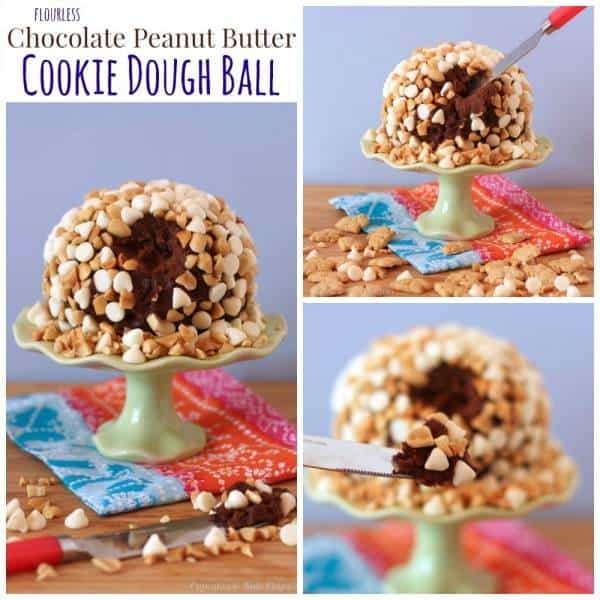 Chocolate Peanut Butter Cookie Dough Ball -> CLICK HERE TO PIN THIS RECIPE! Especially since it is my Chocolate Peanut Butter Cookie Dough Ball. If you’ve ever seen my What’s in the Lunchbox Wednesday posts, you know I try give him nutritious lunches, hopefully with at least a reasonable amount of protein, fruits and/or veggies. So how could I justify sending him to school with cookie dough? Well, this baby is high in protein and fiber, low in sugar (it can be refined-sugar free depending on what sweetener you use, and what you decide to coat it with, if anything), gluten-free, grain-free, and you could even make it vegan. Clearly I am on a bit of a healthy treat kick, if you saw Sunday’s Strawberry Tiramisu Cheesecake Cups (which, if you didn’t, you totally should. Mmmm!). I told you we are talking about Nuts, Beans & Legumes this week, so of course I had to include a new recipe with my favorite legume – peanuts (well, at least when it is in butter form). And the secret ingredient… chickpeas!! 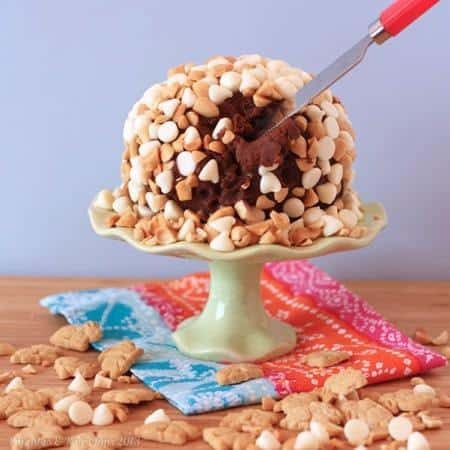 Actually this recipe was inspired by this totally amazing Chocolate Peanut Butter Cake Cheese Ball from Alyssa at What’s Cooking, Love? I seriously was ready to lick my computer screen. I mean, I am a sucker for all things peanut butter and chocolate (I have a entire Pinterest Board devoted to this obsession). But, not to sound like a broken record, you know the deal – wheat allergy and gestational diabetes. So I had to rework that baby, and I thought of my Peanut Butter and Jelly Cookie Dough Dip. This was totally do-able! The Bug actually helped me make this one. We just dumped all the ingredients in the food processor, then he got to watch as we whizzed it up till it formed a “dough ball”. And he was an excellent taste tester! 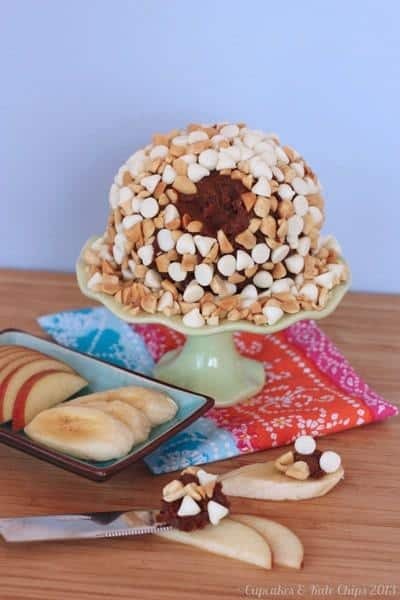 This Chocolate Peanut Butter Cookie Dough Ball is perfect to spread on fruit slices or graham crackers, roll up in a tortilla, spread on some whole wheat bread, or maybe even add some bananas to thatfor a fun sammie. For Easter, you could even set it out with some Annie’s Bunnies for a fun snack for the kids (even the big ones!) that won’t increase their chocolate bunny and Peeps sugar high. So yes, The Bug had cookie dough for lunch (though I did scrape off all but a couple of the white chocolate chips – those are reserved for dessert). Tomorrow you’ll see the “Before” photo of what I sent, but for now I’ll give you a glimpse of the “After”. 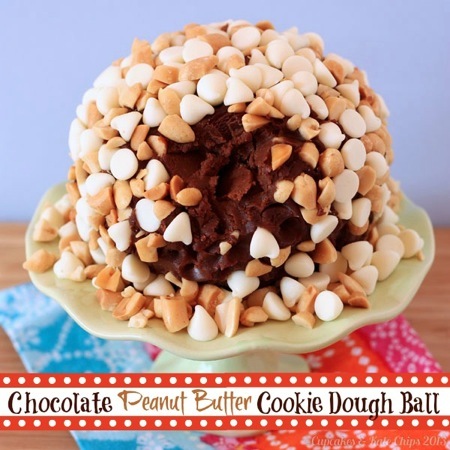 Clearly, this Chocolate Peanut Butter Cookie Dough Ball was Bug-Approved! Chocolate and peanut butter, strawberries and cream, peas and carrots, peanut butter and jelly, tea and cookies, buffalo chicken and blue cheese, bacon & anything… What is your favorite food couple? Optional about 1 c total of any of the following or a combination for coating the dough ball: chopped peanuts, milk, semisweet, or white chocolate, or peanut butter chips, chopped chocolate, etc. Combine the chickpeas, cocoa powder, honey, peanut butter, and vanilla in your food processor. Process until a dough consistency forms, stopping to scrape down the sides, as needed. Gather the contents of the food processor together in a ball and wrap in plastic wrap. Refrigerate at least an hour, or until firm. Place your desired coating ingredients in a shallow pan and roll the ball in the coating, pressing firmly to adhere. Return the dough ball to the refrigerator until ready to serve. Serve with fruit, crackers, etc., or on sandwiches or tortillas, as desired. We love this recipe! I made it a bunch last summer…it made a good pool snack/lunch. So yummy with graham cracker sticks or Annie’s organic graham bunnies. Oh, thanks for the comment! I appreciate it and I’m so glad you enjoy it. 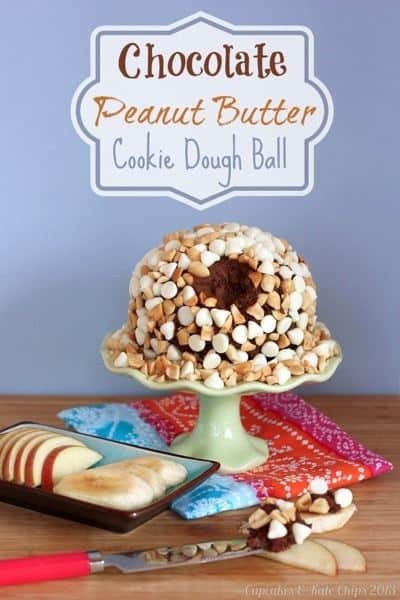 Oh my goodness, I think a cookie dough ball is probably the best idea I have ever heard of. And a healthy one?! Oh man. Pinning this recipe for sure! Thanks! Gotta love being able to eat “cookie dough” guilt free! oh I love this. i’m trying to use chick peas more! 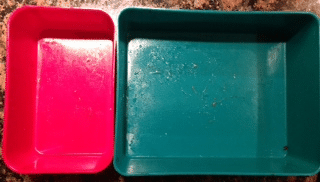 Thanks – this is a fun way to eat chickpeas! I am officially obsessed with this recipe! I just made it for the second time this week! But I used black beans this time and added unsweetened coconut to the dough. Yum! Ooh. love this! And that it’s healthy too! Thanks so much for sharing, found you through Thursday’s Treasures! So glad you stopped by! It is a fun treat! I was just wondering if chickpea flour would be a reasonable substitute for the chickpeas? It might be able to be mixed then outside a food processor if you can use it! I think I will try! Hmm, I haven’t really worked with chickpea flour, but since that is made from dried ground chickpeas, I would think it might not be as firm, but if it works, I’d love to hear from you. Let me know! How neat! I wonder what it might taste like, perhaps a brownie batter or maybe more like peanutbutter..either way, it’s definitely worth trying, for sure. The peanut butter isn’t super strong – you could always add more. I really do think it tastes like a cookie dough. I need to try this ahhh! I have such a terrible sweet tooth all the time I swear! I do too! Luckily this one isn’t too bad! I was eating spoonfuls last night! My son is a chocoholic but he’s dairy free, so mainstream options are very limited. I usually have to make his chocolate treats from scratch. He is also completely obsessed with peanut butter. He is going to freak out when I put this in his lunch! Quick question – does it matter which type of peanut butter I use? I’ve recently run into a lot of recipes that say to use regular PB because the all-natural types don’t hold up well, but I only buy the natural ones. Oh good! Check out tomorrow’s post and you’ll see the couple of ways that I’ve sent it to lunch for my little guy. But after eating a spoonful that I balled up last night, I was thinking little balls of it rolls in wheat germ or something like that would make good “truffles”. I used natural peanut butter and it worked just fine. It’s a little soft when you fist blend it up, but after a bit in the fridge it firms up.